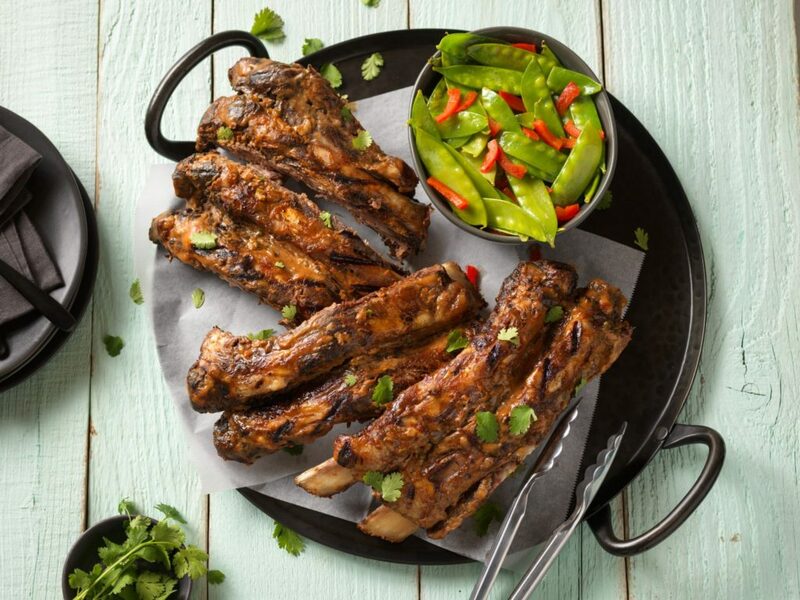 Beef Back Ribs are marinated in an Asian mix and grilled to perfection in this flavorful recipe. Combine ketchup, mustard, hoisin, jalapeño pepper, ginger and water in small bowl; whisk until blended. Reserve 1/2 cup marinade for basting; add brown sugar and set aside. Place beef Ribs in shallow pan or extra large food safe plastic bag; add remaining marinade. Turn to coat. Cover pan tightly or close bag securely; marinate ribs in refrigerator 1 to 4 hours, turning occasionally. Remove ribs from marinade; discard marinade. Prepare charcoal grill for indirect cooking by igniting an equal number of charcoal briquets on each side of fire grate, leaving open space in the center. When coals are medium, ash-covered (25 to 30 minutes), add 3 to 4 new briquets to each side. Position cooking grid with handles over coals so additional briquets may be added when necessary. Cook's Tip: Add 3 to 4 additional briquets to each side of fire grate every 30 minutes or as necessary to maintain proper heat during grilling. Place ribs, meat side up, in large (16-1/8 x 11-3/4 x 2-7/8 inches) foil roasting pan; cover tightly with aluminum foil. Place foil pan on cooking grid; cover with grill lid and grill over medium heat 1 to 1-1/2 hours or until ribs are fork-tender. Carefully remove roasting pan from grill; remove ribs from pan and place, meat side up, on grill rack. Baste ribs with reserved marinade; grill, covered, 10 to 15 minutes, turning and basting occasionally. Sprinkle ribs with cilantro, if desired. Serve with Asian greens and vegetables. Nutrition information per serving: 520 Calories; 35.8g Total Fat; 15.8g Saturated Fat; 1.7g Polyunsaturated Fat; 17.3g Monounsaturated Fat; 0g Trans Fat; 106mg Cholesterol; 779mg Sodium; 423mg Potassium; 17g Total carbohydrate; 30g Protein; 3.2mg Iron; 6.6mg Niacin; 0.7mg Vitamin B6; 105.2mg Choline; 2.6mcg Vitamin B12; 6.5mg Zinc; 30.2mcg Selenium; 0.2g Fiber.